Customer Returned Arduino Wireless SD shield R3. In perfect NEW condition. Ships with original box (opened). 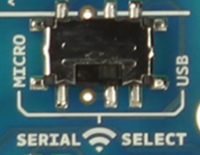 The Wireless SD shield has an on-board switch labelled Serial Select. It determines how the Xbee's serial communication connects to the serial communication between the microcontroller (ATmega8 or ATmega168) and USB-to-serial chip on the Arduino board. When in the Micro position, the DOUT pin of the wireless module is connected to the RX pin of the microcontroller; and DIN is connected to TX. The wireless module will then communicate with the microcontroller. Note that the RX and TX pins of the microcontroller are still connected to the TX and RX pins (respectively) of the USB-to-serial converter. Data sent from the microcontroller will be transmitted to the computer via USB as well as being sent wirelessly by the wireless module. The microcontroller will not be programmable via USB in this mode. 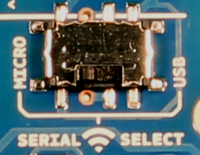 With the switch in the USB position, the DOUT pin the wireless module is connected to the RX pin of the USB-to-serial converter, and DIN on the wireless module is connected to the TX pin of the USB-to-serial converter. This means that the module can communicate directly with the computer. The microcontroller on the board will be bypassed. To use the shield in this mode, you must program the microcontroller with an empty sketch (shown below), or remove it from the board. The Wireless SD shield can be used with different modules with the same footprint as the XBee modules. The instructions below are for the XBee 802.15.4 modules (sometimes called "Series 1" to distinguish them from the Series 2 modules, although "Series 1" doesn't appear in the official name or product description) and also for the XBee ZNet 2.5 or XBee ZB modules, both known as "Series 2" modules. All the modules, basically have the same type of configuration parameters, but differ by the function that they implement and the topologies of networks that they can create. Can communicate with each other only modules of the same family.